The story of a man determined to prove his faith right and finding it wrong. Then 20 questions that should lead every honest seeker of truth to see th error of th eWatchtower Socety while being directed to the life-saving truth of Jesus Christ. 260 PublicationInfo $a Place of publication, dist. U.S.A.
520 Summary $a Summary, etc. note The story of a man determined to prove his faith right and finding it wrong. 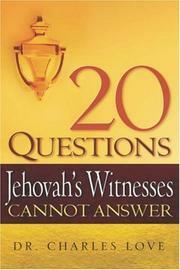 Then 20 questions that should lead every honest seeker of truth to see th error of th eWatchtower Socety while being directed to the life-saving truth of Jesus Christ.